too broadly used name to be categorized? Here are 2 extreme examples of seriously advertised pilot watches of 1940 and 1960 with a modern poser. Hamilton ad reads well on second click. Navitimer actually came from pro pilot's garage sale. He found it impractical. I liked its appearance and high tech. but was happy to make a profit with it. Notice the compact and neat old Lemania. It has the 321 Omega movmt. that was in the original big Speedy Pro. 27 mm. tiny movement in a big case. too broadly used name to be categorized? Here are 2 extreme examples of seriously advertised pilot watches of 1940 and 1960 with a modern poser. Hamilton ad reads well on second click. Navitimer actually came from pro pilot's garage sale. He found it impractical. I liked its appearance and high tech. but was happy to make a profit with it. Notice the compact and neat old Lemania. It has the 321 Omega movmt. that was in the original big Speedy Pro. 27 mm.
" The Sailor Who Fell From Grace With The Sea "
The quintessential pilot watch is the classic Omega Speedmaster Professional, the moon watch. I got advanced press notice and was waiting on Aldrin & Armstrong when they landed. Cheers, Bill P.
Last edited by gaopa; December 26th, 2009 at 16:02. 2 Really nice demonstrations of the modern Pilot watches. Thankyou. Somewhat different from the 1930-40 Ford trimotor type. Gaopa - The only chronograph I really like so I'm sorry to contradict you but it was designed and marketed originally for motorsports fans and then made famous by NASA using it for astronauts but it's not strictly speaking a "pilot's watch". In my opinion being an astronaut probably has more in common with being a saturation diver than an aviator. 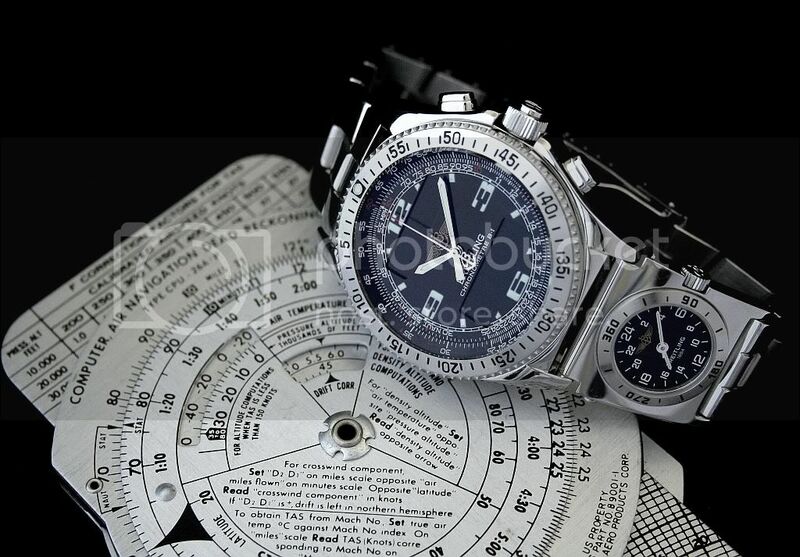 As you are likely aware, whilst there is clearly a traditional and also marketed style for pilots watches the ones that are actually chosen and used are based on personal preference rather than a set feature list. I'm not a fan of clutter on dials so prefer very limited features (no chronograph and no pointless slide rules). Pilots of more complex aircraft use the aircraft's instruments not their wristwatches meaning the usability of their preference is largely unimportant and down to convenience and style/fashion. Your Rolex Explorer II is an ideal "working pilots" watch for me - it ticks all the right boxes for convenience and practicality for military and commercial use (even though it's a variant of the GMT-Master II and not actually a pilots watch in it's own right). Last edited by Redleader; December 26th, 2009 at 18:38. As reported here in the following certain features obviously define the pilot's watch. Just because a pilot uses a time only Polarouter does not make it a dsigned for application preferred Pilot's Watch. So I will not call it a pilot's watch. However, I will still call the time only military issued A11 time only black face sweep second hand a pilot's watch specific for w.w.2. Well, I think that we have beat this dead horse more than once around here, but I don't really tire of the subject. As aviation has recently passed the century mark, we have had a lot of technology changes in watches coinciding with the remarkable and parallel advances in aviation. I am wearing my Yes Zulu right now as I sit in a Shanghai hotel room. I have been on 5 continents in the last 10 days or so, and my Zulu is a true aviation tool. I also brought my Fortis B42 GMT with me which I wore for a few days, but I find that the Zulu is easier to use when I am really jumping time zones. I wore the same B1 that Ron posted above while I was in Iraq. It was a good tool for the job as a new school watch packed with features. I still like old school fleigers, and everybody ought to own one, but they don't serve much purpose for the kind of flying that I perform. "Some people work for a living, me, I'd rather fly!" Super. A real professional expert's advisory opinion. A 1930's ford trimotor is not today's technology and operation as is the pilot's watch. Fine conclusion to this question. This has been a fun and enlightening thread! Not being a pilot I have learned from those of you who are. Thanks guys. Cheers, Bill P.
Or.... how about the Lum-Tec Combat B3? Cheers, Bill P.